Greater personal insight leads to better leaders. The better we understand and develop our strengths, while facing and working on our weaknesses, the stronger leader we’ll become. We understand this at work, so many jobs offer a 360 degree feedback loop where peers and subordinates have a chance to rate a co-worker in certain categories. This type of task gives great feedback and insight to any employee. If it works at work, then why not use a 360 degree feedback loop at home with our family to help us become better leaders as parents to our children? So, I made one. 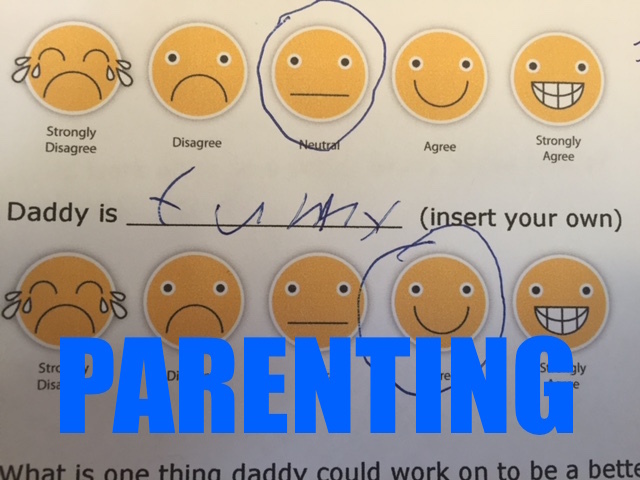 I created a 360 Degree Parenting Leadership Feedback, which I used with each of my three children. I have three boys, ages 8, 6, and 3. My kids and I actually found the process fun and insightful. Before I share how it went, I’d love for you to go through this document with your kids too. You can get a free download of my 360 Degree Parenting Leadership Feedback by subscribing to my blog. All that’s needed is your name and e-mail address. So, now…what did I learn? I talked with each of my kids individually, beginning with my oldest. It was a lot of fun explaining to them what “feedback” is and why I’d like to do this assessment. I explained that I’d like to be the best dad possible and so would love to ask them a few questions. I began with the positive by asking what things they love that I do. The most helpful insight I gained from this question was into my children’s differing love languages. Because my kids are younger, most of their answers involved me buying them stuff, or letting them do special things like “staying up to watch a movie”. But, one of my kids loved when I scratch his back at night. This is helpful insight. I asked my kids what I do that they don’t like and why. My 8 year old had some really great feedback on this one. All three kids would like me to yell less, which I expected as an answer. This is the hard one to ask, but probably the most important. How many times have you wished a parent or boss would ask you how the company could improve, or how they could do better as a boss or parent? I believe most employees and children want to believe their opinions, insights, and thoughts matter and can influence others. Listening to our children helps give them confidence to lead as they learn that their opinions carry weight and influence. 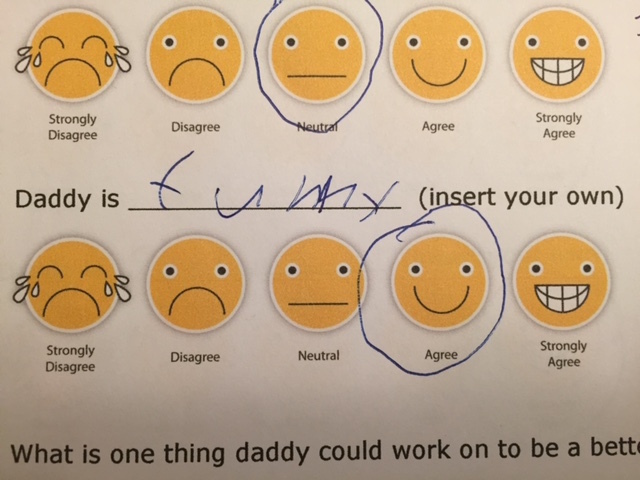 I left one space blank for each of my children to write in their own daddy descriptor and then rate me on that trait. This opportunity dissolved quickly with each child. I love that my 8 year-old thought to describe me as funny. But, I was very concerned that I only earned 4 out of 5 on his “funny” scale. I thought I deserved a full 5. 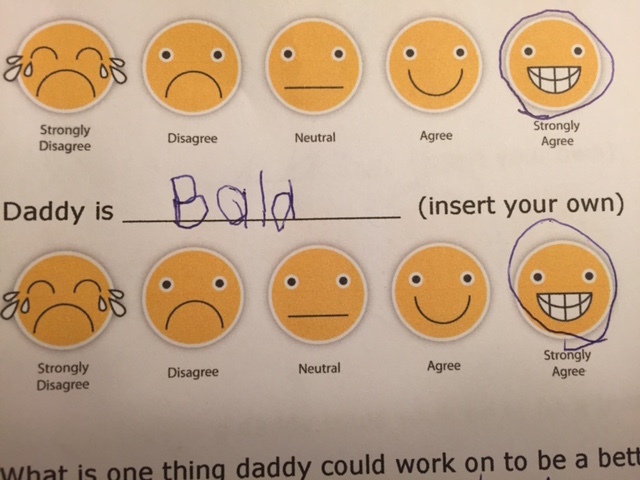 I was excited to earn a 5 out of 5, but disappointed that it was on the “bald” scale. I do agree that I deserved high marks on that scale and appreciated his insight. 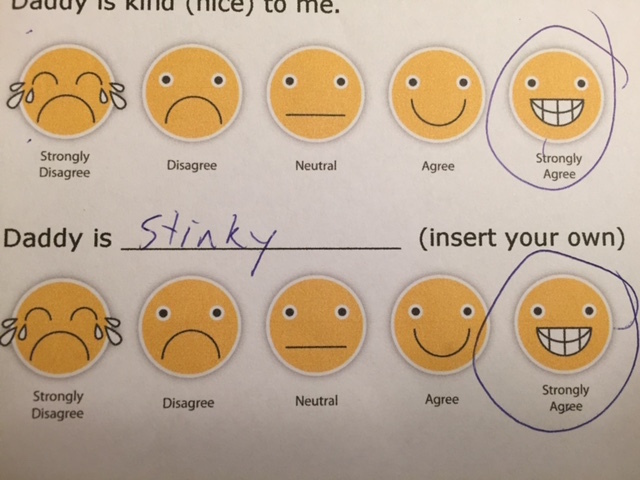 My youngest child also thinks he’s pretty funny and was very proud of himself for describing his father as “stinky.” For the record, I bath quite often. But, I was again excited to receive high marks on his scale. Learning that I need to yell less and listen more was insight worth its weight in gold. Whether your kids are 3 or 15, what insight do they hold that could make you a better parent-leader? Subscribe to my blog and you’ll be able to download the original word document and change the questions to better fit your family. I found it fun and very insightful. I hope it helps your family also. Haha I love their creative answers . Thanks! It was pretty funny.